West Windsor, N.J.– The patrol officers don’t carry firearms and there are lots – maybe too many? – surveillance cameras on the streets of London. 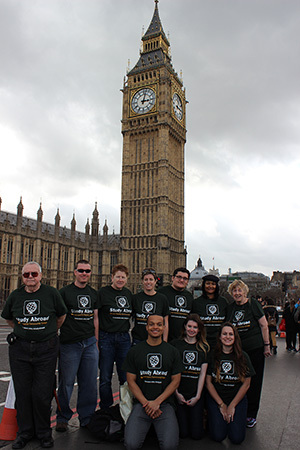 Those were just two take-away observations from a group of Mercer County Community College (MCCC) students who traveled to the British capital for eight days over spring break in March. Led by Criminal Justice faculty member Elizabeth Bondurant, most of the students were enrolled in the “Police in the Community” (CRJ 102) Study Tour course. Bondurant says there was tremendous educational value in adding a travel component to the traditional curriculum. Criminal Justice student Hailey Skopas agreed, observing, “I learned the material better out there experiencing it than in a classroom.” Skopas made a video chronicling the trip that she presented at a post-trip wrap-up session on April 25. The itinerary included a visit to Parliament, where students witnessed a lively legislative debate, and the Tower of London, where they saw weaponry and instruments of punishment used against law breakers throughout British history. Other attractions included the London Metropolitan Police Museum, the Sherlock Holmes Museum, the British Museum, the Jack the Ripper Walking Tour, and the Clink Prison Museum. A Thames River Boat Tour provided a view of major sites including Big Ben, the Houses of Parliament, St. Paul’s Cathedral, Tower Bridge and the Tower of London. An added treat was a lecture by a bobby (a British patrol officer) at the hotel about his life as an officer on the street. Students also struck up conversations with bobbies as they traversed the city. All the travelers say they found London to be a manageable city, where the people were polite and the public transportation was easy to navigate. The group was unanimous that British food was just fine with them. They especially gave a big thumb’s up to specialties like Shepherds Pie and fish and chips. They even found a pizza parlor that served pizza rivaling New Jersey’s best. 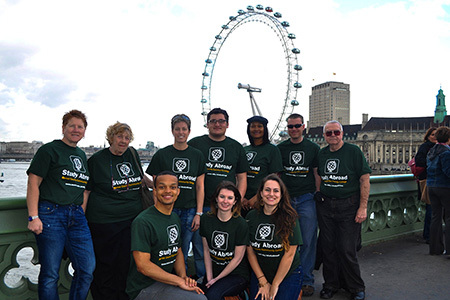 Pictured in front of the London Eye, one of the word's biggest ferris wheels, are, back row from left, Criminal Justice faculty member Elizabeth Bondurant, Bernadette Eichinger, Tara Luyber, Billy Bloomberg, Tomika SOmmers, Eric Schutack, and Thomas Eichinger; front row from left, Matt Lynch, Kelly Blake and Hailey Skopas. 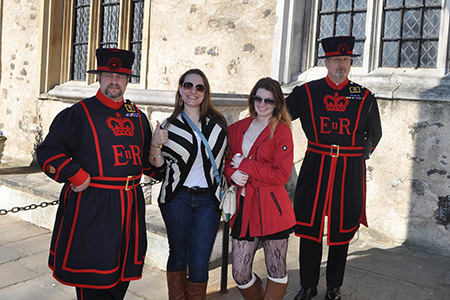 Hailey Skopas and Kelly Blake with Tower of London guards. Despite a wide difference in their ages – from typical college age to two senior citizens – the MCCC travellers says they formed a bond that felt like family by the end of the trip. And all agree that the trip to London has whetted their appetite for additional travel experiences. MCCC’s Study Abroad Program includes short-term, faculty-led Study Tours and full semesters abroad. Study Tours for the 2014-15 academic year are currently being planned. For more information, click here, email studyabroad@mccc.edu or call 609-570-3660.